Colombian-born Fernando Botero (b. 1932) is a painter, sculptor, and draftsman renowned for his extravagantly rounded figures combining the polish and excess of Spanish colonial baroque with the social realism of the Mexican muralists. Their humorous exaggeration belies the more serious content of Botero's work-commentary on colonialism, political instability in Latin America, and the vernacular artistic traditions of the region, as well as European art history. 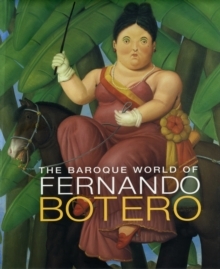 Accompanying the artist's first American retrospective in over thirty years, The Baroque World of Fernando Botero is the most extensive study of his life and work to date. Drawn exclusively from Botero's private collection, the 100 works featured in this book, including previously unpublished paintings and drawings, represent the full scope of his oeuvre from a uniquely personal perspective. Many of these-portraits of friends and family members and remembered scenes-have remained in the artist's possession since their creation, while others he has bought back over the years as markers of significant developments in his career. Three essays examine the artist's creative life, from the aesthetic environment in which Botero developed his unique style to his catalyzing influence on the Colombian art world of the 1960s and 70s. Pages: 283 pages, 89 b-w + 128 color illus.